The Empathy Top Five: Who are the greatest empathists of all time? The moment has finally come for the Outrospection blog to put its cards on the table and boldly declare who are the greatest empathists of all time. Our selection committee has been painstakingly deliberating over the choices for several months, and you might well be surprised by the results. No, Barack Obama does not appear in our top five, even though he believes ‘the empathy deficit’ to be the greatest scourge of modern society. And not even famed empathetic individuals such as the Dalai Lama, Mother Teresa or Jesus Christ have shown what it takes to make the grade. Like all ranking charts, the choices are bound to be controversial. But I can assure you that a very careful formula has been used to make the selection. To find themselves on this exclusive list, a person has to display a unique combination of traits: they must have a highly developed capacity to step into the shoes of other people; their empathising must have had a major social impact; it should have required acts of personal courage; and finally, it must provide inspiration for others. Hilary Swank playing Brandon Teena in the 1999 film Boys Don't Cry. Coming in at number five is Hollywood actress Hilary Swank. She gains her coveted place for her Oscar-winning role in the 1999 film Boys Don’t Cry, which is based on the real-life story of Brandon Teena, a transgendered man who was raped and murdered by his male friends after they found out that he had female genitalia. In preparing for the part, Swank cut off her hair, dressed up in her husband’s clothes, put on a cowboy hat, and ventured out onto the streets of New York for a month to see if she could pass for a young man, just as Brandon Teena had done. Describing her adventure, she said, ‘I got to see what it’s like for a transgender person, or a person with a sexual identity crisis, or a lesbian or a gay person, and the daily harassment you can get…it’s a scary place to be, to feel not understood’. Swank’s brilliant portrayal of Brandon Teena helped raise the political profile of the struggles faced by transgendered people, and also inspired her to become a campaigner on gay, lesbian and transgender issues, and a spokesperson for the Harvey Milk School in New York. Find out more: Watch the film Boys Don’t Cry and visit the website of the Harvey Milk School. George Orwell in 1946, pushing his adopted son Richard through the streets of Islington, North London. How could you have an Empathy Top Five without putting George Orwell on the list? He earned his empathy spurs in the 1920s while working as a colonial police officer in Burma. Orwell was disgusted at the brutality of colonialism which he witnessed first-hand, and vowed on his return to Britain to step into the shoes of everyday working people and discover what their lives were really like. ‘I felt that I had got to escape not merely from imperialism but from every form of man’s dominion over other man’, he said. ‘I wanted to submerge myself, to get right down among the oppressed; to be one of them and on their side against the tyrants.’ That’s when he decided to dress up as a tramp and live amongst beggars and vagabonds on the streets of East London, a time of his life described in Down and Out in Paris and London (1933). With this book, together with his political reportage, Orwell shone the spotlight on neglected and marginalised communities in British society like almost no other writer in the twentieth century. Find out more: Read Down and Out in Paris and London, and Orwell’s short essay ‘Down the Mine’. Charley, killed by cholera in 1849. Find out more: Read the fascinating biography Harriet Beecher Stowe: A Life by Joan Hedrick. 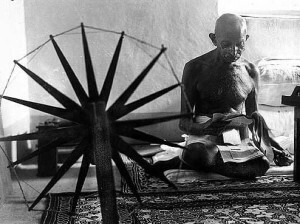 Mahatma Gandhi taking a rest from spinning cloth in 1946. He is one of the few political figures in history able to make his own underwear. I realise this may create gasps of incredulity, but the great master of empathy Mahatma Gandhi only comes in at second place. After his return to India from South Africa in 1915, Gandhi decided that if he was going to campaign for Indian independence from British rule, he would need to experience what life was really like for the poorest people in the country. So he threw away his fancy barrister’s suit and collar, wrapped himself in a dhoti or loincloth, and established the Sabamarti Ashram, where he lived from 1917 to 1930. Ashram life was about stepping into the shoes of peasant farmers. He and his followers grew their own food, spun their own cloth, and cleaned out the latrines – a job usually relegated to the Untouchable (Dalit) caste. Gandhi’s deep empathetic instinct also took him across religious boundaries. He was appalled by the violence between Hindus and Muslims, and fervently opposed the creation of a separate Muslim state. A devout Hindu himself, he once declared to a group of Hindu nationalists: ‘I am a Muslim! And a Hindu, and a Christian and a Jew – and so are all of you.’ These words, which still resonate today, rank amongst the greatest empathetic statements of all time. Find out more: There’s no better starting place than Richard Attenborough’s epic film Gandhi. Also try Gandhi’s An Autobiography – or The Story of My Experiments with Truth. C.P. Ellis, the former Ku Klux Klan leader, with his friend Ann Atwater. Top of our empathy poll is…C.P. Ellis. ‘Who?’, you are bound to ask. C.P. Ellis was born into a poor white family in Durham, North Carolina, in 1927. Finding it hard to make ends meet working in a garage and believing blacks were the cause of all his troubles, he followed his father’s footsteps and joined the Ku Klux Klan, eventually rising to the top position of Exalted Cyclops of the Durham chapter of the KKK. The turning point in his life came in 1971, when he was invited to a ten-day community meeting to help solve racial tensions in schools. C.P.Ellis was chosen to head the race committee jointly with a local black activist who he hated, named Ann Atwater. But working with her completely exploded his prejudices about African Americans. He saw that she shared the same problems of poverty as his own and that their real enemies were white businessmen and politicians who kept their wages low and pitted poor blacks and whites against one another. ‘I was beginning to look at a black person, shake hands with him, and see him as a human being,’ he recalled of his experience on the committee. ‘Somethin’ was happening to me. It was almost like bein’ born again.’ On the final night of the community meeting, he stood at the microphone in front of a thousand people and tore up his Klan membership card. C.P. Ellis later became a famed civil rights campaigner and labour organiser for a union whose membership was seventy per cent black. He and Ann remained friends for the rest of their lives. Find out more: Read the moving interview with C.P. Ellis by the oral historian Studs Terkel in his book, American Dreams: Lost and Found. You can also find an extract here. I imagine you have your own empathetic heroines and heroes, so I invite you to leave a comment revealing to the world your personal choices of people who deserve a place in the Empathy Hall of Fame. My discovery that someone else shares my belief in the crucial role of empathy in human matters is very satisfying. However, I must admit to some doubts in your apparent confidence that empathy can be taught. 1. Is there an empathy gene or is it acquired through experience? 2. Regardless of your previous answer, is lack of empathy the consequence of suppression by other traits, such as narcissism, or is it simply not acquired by some people? 3. Does empathy exist in all of us, but only expressed selectively (i.e. we can empathize with some people, but not others, for whatever reason)? 4. Finally, what makes you think it can be taught? I’m 13 and I know I’m a empath everyone looks at me like I’m an alien who is crazy.Is it cuz of age or will it always be this hard. are few of my heroes of Empathy, inclusive of the list you have shared. Jesus is tops for sure. Ive always known something special existed in people. I wont label myself just yet….but ive felt so in touch with people’s emotions and im always connected to a narcissist or sociopath ; beleiving i could fix them. I may be an empath. I dont know if i am helping as much as i think i could though to fall into that category. I am depressed by what i see around me and my heart is so sensitive to other’s pain. Ghandi has always been my inspiration as well as Mother Theresa. Trouble me, burden me…lay it on me. I get caught saying that and the world seems to morph on me. If someone reads this , know that i am so saddened by what i see but i know what good there can be if we could somehow navigate our way into common ground . There are so many hurt right now. I AM 16 YRS OLD AND BOTH OF MY PARENTS ARE NARCISSIST . THEY DONT UNDERSTAND ME. PEOPLE LAUGH AT ME SAYING I’M OVERREACTING AND TOO WEAK. AND THE GREATEST GIFT OF ALL THEY HAVE ALL IT MAKES ONE TO BE SUCCESSFUL .PROUD TO BE AN EMPATH.